Quis custodiet ipsos custodes? Who watches the watchmen? Plovdiv. 33-year-old driver of armoured cash transport car in Plovdiv stole BGN 1.5 million. The man was declared for a nationwide search. Yesterday at 14.25 in the First Regional Police Department was received a signal that there was an abandoned security van on Petrova Niva Str. During the investigative activities has been established that there were about BGN 1,5 million in a different currency missing from the car owned by a private security firm. Driver of the cash transport car George Enev (33) from the town of Plovdiv is suspected of committing the offense. In connection with the search police presence in Plovdiv is stepped up. Police stop vehicles and check IDs. The inspection of the vehicle found that it is owned by a private security firm G4S. Clients of the security firm headquartered in England, are Governments, banks, insurance companies, industrial companies, commercial companies, public institutions and private individuals. Last year, Danny Fitzsimons, a G4S ArmorGroup security guard in Iraq was convicted of shooting and killing two G4S colleagues, after a Baghdad bar fight. His family insisted he suffered from post-traumatic stress from an earlier stint in Iraq as a British paratrooper, and was so unstable, G4S ArmorGroup should never have hired him. After last week’s triple homicide at the University of Alberta’s HUB Mall, that ancient question has haunting relevance. Armoured car guards Michelle Shegelski, Brian Ilesic, Eddie Rejano, and their wounded colleague, Matthew Schuman, were employees of G4S Secure Solutions, the world’s largest private security company. So was Travis Baumgartner, 21, now charged with shooting them. Over the last few days, G4S has repeatedly asked Edmontonians to donate to a trust fund the firm established for the victims’ families. G4S won’t say how much, if anything, it is contributing. It’s a lovely gesture to create a trust to accommodate a spontaneous outpouring of community generosity. But for the world’s second-largest employer, a firm with 657,200 staff in more than 125 countries, to launch a corporate fundraising campaign, without leading by example, is little short of offensive. According to G4S’s 2011 annual report, last year it had revenues of about $12 billion, and profits of about $317 million. It’s part of the security-industrial complex that ballooned after 9/11. The Anglo-Danish multinational doesn’t just guard bank deliveries. Cash security is just 17 per cent of its global business. In Australia, G4S was hired to provide detention services for refugee claimants and prisoners, with disturbing results. In 2007, the Western Australia Human Rights Commission concluded G4S drivers locked detainees in a scorching van without food or drink, leaving one man so dehydrated one drank his own urine. G4S was ordered to pay a $500,000 fine. In 2008, an aboriginal man in G4S custody of died of heat stroke after being driven through the desert in a metal pod behind a prisoner van. It was so hot inside, the man was severely burned, where his skin touched the metal floor. G4S was fined $285,000. 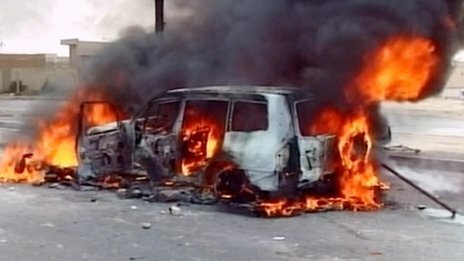 Are such controversies relevant to the HUB tragedy? A transnational conglomerate can’t be held responsible for the alleged actions of one employee among 657,000. And no psychological screening process in the world can infallibly predict human behaviour. Yet this tragedy, fundamentally, is about one G4S employee accused of shooting four others. In a world where governments increasingly contract out police, prison and quasi-military services to for-profit companies, it’s worth asking how we ensure these guns-for-hire are fit to carry them and how we hold a corporation accountable when things go wrong. A whistleblower who claims staff cut corners while vetting security staff for the London Olympics was escorted from her place of work. 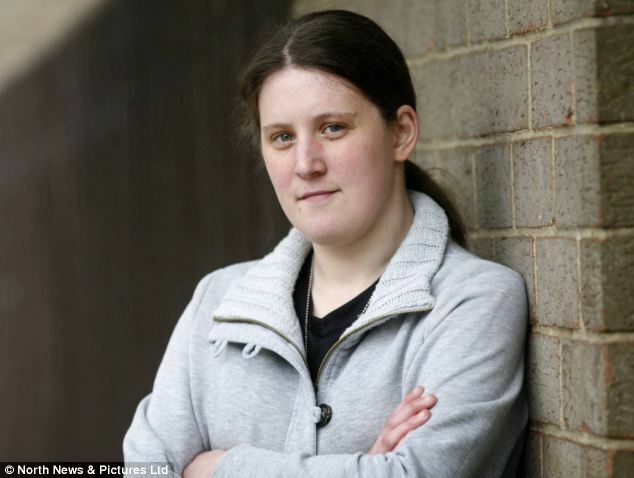 Data input clerk Sarah Hubble was interviewed by bosses, then told not to return after contacting the media about her experiences working for G4S. Miss Hubble, 27, from Darlington, County Durham, claimed the system was creaking under the pressure of processing thousands of applications ahead of this summer’s games. She said staff had to process a minimum of ten applications an hour and that the documents ended up piled in corners at the office in Stockton-on-Tees. Pilgrims Group has helped the family of incarcerated ex-soldier Danny Fitzsimons attend their son’s trial in Iraq. Accused of murder, Danny Fitzsimons was being held in Iraq’s Karadt Mariam police station when his family lost all hope of seeing their son. When no other companies would assist, Pilgrims offered the Fitzsimons family a low cost solution that ensured their safe passage in Iraq by providing secure accommodation, transport to and from the airport and safe passage to and from the courthouse where their son was being held. His family had not seen Fitzsimons since he flew to Iraq to work as a security contractor for another company in August 2009. They wanted to see their son before a verdict on the trial was reached, but required security assistance to ensure their safety. A campaign by the Fitzsimons family to bring Danny back to the UK based on his history of mental health issues had been ignored by the British Government, while requests for support from major security firms had hit a brick wall leaving them with very few options. A £9,000 contribution had been made by the company that originally employed Fitzsimons to work in Iraq, but money alone was not sufficient for the family to make such a high profile trip. Importantly, specialist understanding of the city of Baghdad was required. Bill Freear, the managing director of Pilgrims, told The Independent newspaper that while he could not comment on the events that led to Fitzsimons’ imprisonment, he also recognised that Fitzsimons’ family were “completely innocent” and deserved assistance to see their son. He added that Pilgrims had the capability to help, and was pleased that the company was able to do so. A DOUBLE murderer who served with the Army in Colchester was due to stand trial for racially aggravated assault in the UK before he killed two contractors in Iraq. Former paratrooper Danny Fitzsimons, 31, was sentenced to at least 20 years in an Iraqi prison earlier this year. But his violent tendencies had already surfaced with Fitzsimons facing an assault charge at Bolton Crown Court, according to the Manchester Evening News. People with PTSD can have “heightened levels of physiological arousal,” such as elevated heart rates even though they are not in real danger, Baldwin said. “Because they feel unsafe, they’re more likely to be triggered into a defense state that might get them out of a traumatic experience that isn’t really happening,” he said. Clive Stafford Smith, Reprieve’s director, said: “If G4S had done the proper checks and risk assessments when Danny applied to work with them, they would have quickly seen that he was suffering from serious PTSD, a consequence of loyally serving his country. A British former soldier has been jailed for 20 years by the supreme court of Iraq for the murder of two fellow security contractors, becoming the first westerner to be convicted in the country since the 2003 invasion. The family of 31-year-old Danny Fitzsimons expressed relief that he had escaped the death penalty and asked Iraqi authorities and the UK government to ensure his safety in prison. Defence lawyers indicated they would try to get the term reduced. Before his conviction and sentencing in a hearing lasting less than 30 minutes, there had been talks over whether he could be transferred to a British prison. Fitzsimons’s family and campaigners fear for his safety if he is moved outside Baghdad’s Green Zone to the city’s Rusafa prison. 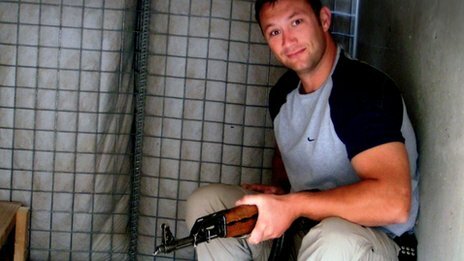 Fitzsimons, from Middleton, Manchester, was accused of shooting fellow Briton Paul McGuigan and Australian Darren Hoare in Baghdad, colleagues with the UK security firm ArmorGroup, part of G4S, after an argument in the Green Zone in August 2009. He was also accused of wounding an Iraqi guard while fleeing. The incident happened within 36 hours of his arrival in the city. He had worked in the country before. Fitzsimons admitted shooting the men but claimed it was in self-defence. The colleagues had been out drinking and the other two tried to kill him during an altercation, he said. 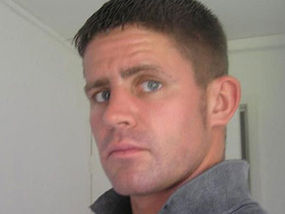 Fitzsimons claimed to be suffering from post-traumatic stress disorder (PTSD). In an interview before the sentence, he told the Independent he had been treated “like a dog” in court. Sentencing of Daniel Fitzsimons, a British security contractor accused of murdering two colleagues in Baghdad has been adjourned until 28 February after a late intervention from his UK-based lawyer. Judge Ali Yousef in Baghdad’s serious crimes court ordered further clarification of the term post-traumatic stress disorder, which is not recognised by Iraqi law but has been heavily relied on as a defence by Fitzsimons. Fitzsimons has pleaded not guilty to murder but admitted manslaughter with diminished responsibility, claiming he acted in self defence. 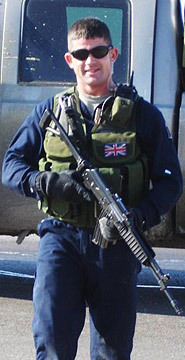 He is accused of shooting dead two fellow ArmorGroup security contractors, Paul McGuigan, a Briton, and Darren Hoare, an Australian, at a base inside Baghdad’s Green Zone in August 2009. If convicted, he could face a death sentence. In only a matter of hours , barring further delays, Danny Fitzsimons will face sentencing for shooting and killing Darren Hoare and Paul McGuigan in ArmorGroups living quarters in the Green Zone. A possible death sentence. The first Contractor to be tried in the Iraqi Courts under Iraqi Jurisdiction. Under Iraqi Jurisdiction there was no formal inquiry into who armed a man with several psychiatric diagnoses, a criminal record, pending weapons charges, who was fired from two other security companies and was known to be a problem among his peers. Under US or UK law ArmorGroup would bear some responsibility for arming a man this whacked. 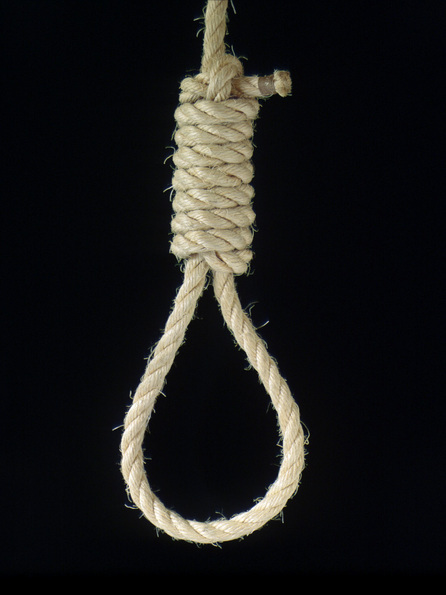 Maybe even be considered accessory to the murders. Negligence of this nature occurs as a matter of rule with some of these Contract Companies. Like Armorgroup did, just under bid the contract so you can win it. The solution then is to understaff, overwork, refuse to provide the necessary equipment that was contracted and paid for, and put any warm body in place without vetting them to ensure that they are who and what they claim to be. How many accidents, injuries, and deaths have occurred due to negligence of this nature? We will never know. Very few incidents are publicized. Contractors with psychiatric meltdowns are spirited away and promoted or dumped on their families. The victims of the melt downs are paid to keep them from filing a Defense Base Act Claim. Deaths and Injuries of many foreigners are never filed on because they and their families do not know they are due benefits. Defense Base Act Claim filings are the only numbers kept. All accidents in the warzones are the fault of no one due to the DBA’s Exclusive Remedy and dead men tell few tales when no real unbiased investigation is required. There has been a very vocal outcry from the families and friends of Paul McGuigan and to a lesser extent Darren Hoare regarding what a bad man Danny Fitzsimons is and how they cannot wait to see him hung. We get these comments on our blogs as well as witness them in recent media coverage. But there is an odd abscence of them laying any blame where it us undoubtedly deserved upon the negligence of ArmorGroup for arming Danny Fitzsimons and putting their loved ones in his path. Darren Hoare and Paul McGuigan paid for this negligence with their lives. The families of all involved have paid dearly and always will. Danny Fitzsimons will soon pay for his actions, as well as every wrong done by every Contractor to the Iraqi people. Danny Fitzsimons is to the Iraqi’s what Raymond Davis is the Pakistani’s. Danny Fitzsimons is Blackwater in their eyes. Armorgroup continues to guard the US Embassy in Kabul despite having the low bid contract “taken away”. AN AUSTRALIAN contractor killed in Iraq by one of his colleagues has been remembered as a ”great bloke” and a sorely missed father, and the man standing trial for his murder says he acted in self-defence. Mr Fitzsimons said the men had attacked him after a drunken brawl in which he had punched Mr McGuigan. Mr Fitzsimons – who submitted a psychiatric report to the trial saying he suffered from post-traumatic stress disorder – has pleaded not guilty. He also told the court he did not think he was being given a fair trial. 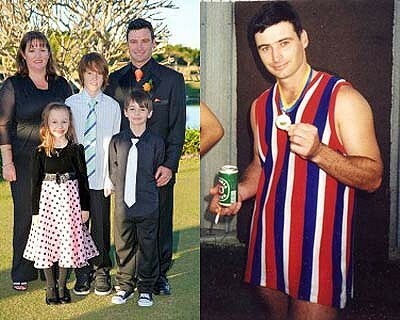 A former team-mate from Mr Hoare’s AFL football club, Peter Johnson, 47, said Mr Hoare and his wife were well-loved and respected members of the Curra Swans football club, and local community. The trial had been adjourned until February 20 as the court had sought clarification over Mr Fitzsimons’s psychiatric report, his lawyer, Tariq Harb, said. The trial follows a U.S.-Iraq security agreement that went into effect in January 2009, ending foreign contractors’ immunity. Before that, Iraqis had complained that private security contractors were operating in a state of lawlessness, never held accountable by Iraqi authorities for incidents in which Iraqis were killed. At Fitzsimons’ trial Sunday was Hassan Jaber, an Iraqi lawyer who was wounded in the Blackwater shooting incident. After the trial, he told CNN he was very happy to see a British citizen being held accountable for a crime in Iraq, calling it a sign of Iraq’s sovereignty. We ask again why ArmorGroup is not on trial for endangering the lives of everyone they exposed to an armed Danny Fitzsimons? Paul McGuigan and Darren Hoare are dead because of ArmorGroup’s negligence in failing to Vet a mentally ill employee with a weapons charge pending in England. And who paid the families of the dead? The Defense Base Act’s Exclusive Remedy relieved ArmorGroup of responsibility but does not pay benefits when alcohol is involved. Upon arrival, he was given an M4 rifle, a pistol and a bullet-proof vest which he set down in his room before meeting with an old friend he had made during a previous tour in Iraq, where he worked with three different firms before joining ArmorGroup. British security contractor accused of murdering two colleagues in Iraq has given his first courtroom account of the drunken night that has left him facing a possible death sentence. Daniel Fitzsimons, a former paratrooper, told a criminal court in Baghdad today that he was not guilty of murdering Briton Paul McGuigan and Australian Darren Hoare in August 2009, but was guilty of manslaughter due to diminished responsibility, after he responded to taunts from both men. Fitzsimons claims he was watching a DVD with a colleague from his army days, Kevin Milson, when McGuigan joined them. Fitzsimons had returned to Baghdad just over 24 hours earlier, following two previous tours with other security companies. He said he did not know McGuigan, but claimed intra-military tensions soon played out between them. Fitzsimons’s testimony was similar to an account he gave to the Guardian in March last year. He claims to have been provoked, first in Milson’s room and then, later, in his own cabin, where he had returned to use the internet. “I had been on the internet for an hour and then slept and then my door crashed in,” he said. “I saw Paul McGuigan and the Australian man, Darren Hoare. They kicked me in the face with their sandals. They wanted to kill me. It was shameful for a soldier. “Paul took my M4 [assault rifle] from beside my bed and pointed it at me. He said ‘I am going to kill you’. I raised my pistol and shouted to Paul twice to put down his weapon, but he did not respond. Then I made my decision, as an old soldier, as a trained soldier, I shot him twice in the chest and a third time in his face as he fell. Fitzsimons had been diagnosed in Britain with post-traumatic stress disorder, but the Iraqi court is yet to decide whether that will be used in his defence. Iraqi medical experts have twice found that Fitzsimons was suffering no particular emotional disorder at the time of the killings. The judge, Ali Yousef, questioned Fitzsimons on forensic evidence prepared for a coroner, which said powder burns were absent from Hoare’s body, not supporting Fitzsimons’s account of a close contact struggle during which fatal shots were fired from a short range. Salam Abdul Kareem, a lawyer for the victims’ families, urged the court to hand down the maximum sentence, which is death by hanging, or life imprisonment. “He did not stop shooting until all 14 bullets were finished,” he said. 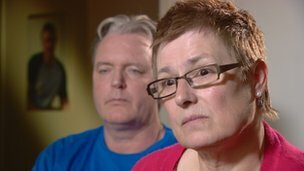 McGuigan’s relatives and former fiancee in Britain have strongly challenged Fitzsimons’s version of events, claiming McGuigan was executed. BAGHDAD — The British security guard accused of killing two of his colleagues in the Iraqi capital’s Green Zone insisted at his trial on Sunday that he acted in self-defence during an alcohol-fuelled brawl. Danny Fitzsimons, 30, told Karkh criminal court in west Baghdad that the two men, fellow Briton Paul McGuigan and Australian national Darren Hoare, had burst into his room and pinned him down before pointing an M4 rifle at his face, prompting him to use his pistol to kill them. “It was very clear that he acted in self-defence, and we also submit that he has psychiatric problems,” Fitzsimons’s Iraqi lawyer Tariq Harb told the court, referring to a court report that said the defendant suffered from post-traumatic stress disorder. In comments translated to the court into Arabic, Fitzsimons, who faces a maximum sentence of death if convicted, said he had returned to Iraq on August 8, 2009, to work as a private security guard with ArmorGroup, a British-based security firm. Fitzsimons and his friend, another ArmorGroup security guard who was identified only as Kevin, bought two bottles of whiskey before settling in Kevin’s trailer in Baghdad’s heavily-fortified Green Zone to chat over drinks. At a later point, a visibly-drunk McGuigan entered the trailer and disparagingly referred to two of Fitzsimons’s late friends, both killed in Iraq, as homosexuals, prompting Fitzsimons to punch him in the face. The two, according to the defendant, shook hands to reconcile but continued to argue for the remainder of Fitzsimons’s time in the trailer, prompting him to return to his own trailer and go to sleep. At around 1 am, Fitzsimons said, McGuigan and Hoare burst into his trailer, with Hoare pinning him down while McGuigan began hitting him in the face with a sandal. McGuigan then grabbed Fitzsimons’s M4 and pointed it at his face, threatening to kill him. According to Fitzsimons, McGuigan used threatening and crude language, which the court-appointed female interpreter refused to translate verbally, instead writing the words for the judge. The defendant said that, at that point, he manoeuvred into a position to grab his pistol and fired two rounds into McGuigan’s chest followed by a bullet into his face. After a tussle with Hoare, Fitzsimons recalled firing two or three rounds into the Australian’s body. He then ran outside his trailer to call for help but when none came, decided to run to the British embassy, which is also located in the Green Zone. He was then confronted by an Iraqi guard working for ArmorGroup, Arkaan Mehdi, who pointed his weapon at Fitzsimons. The defendant said he fired one round into Mehdi’s leg to get him out of his way, and fled. He also entered a plea of not guilty. The trial was adjourned until February 20 as the court sought clarification over his psychiatric report, Harb said. Danny Fitzsimons was hired by ArmorGroup to carry a gun despite having been diagnosed with PTSD, being in trouble with the law, and posting on Facebook about “The War Inside His Head”. ArmorGroup should be on trial here too. The trial of a British security contractor charged with killing two of his colleagues last year opened Wednesday in Baghdad with testimony from a guard who said the contractor shot him. Danny Fitzsimons, who attended the hearing, is the first Western contractor on trial in an Iraqi court since a 2009 U.S.-Iraqi security agreement lifted immunity for foreign contractors. Iraq pressed hard for foreign contractors to be accountable for their actions after armed contractors employed by the North Carolina-based Blackwater Worldwide, now known as Xe, opened fire at a Baghdad intersection in September 2007, killing 17 civilians. Fitzsimons is charged with two counts of premeditated murder in the deaths of two contractors, a British and an Australian, during an argument last year inside Baghdad’s fortified Green Zone. He is also charged with an attempted murder of an Iraqi guard working for a British security firm. Fitzsimons could receive the death penalty if convicted. The trial opened with a testimony of the Iraqi guard who claims Fitzsimons shot him in the leg. Arkan Mahdi Saleh, an Iraqi guard at the security firm ArmorGroup that also employed the defendant and the two slain men, told a three-judge panel that he saw Fitzsimons with a pistol before he was shot. “I was standing at a guard post when I heard some movements behind me,” said the 33-year old Saleh. “When I turned back to check, I saw Fitzsimons with a pistol in his hand and aiming at me,” Saleh, identifying the defendant as the man who shot him. Two other witnesses took the stand on Wednesday, confirming much of Saleh’s account of the shooting. One said he saw Saleh lying wounded on the ground. Fitzsimons appeared in court clean shaven, wearing a beige shirt, jeans and sneakers. He stood behind a wooden fence with two security guards closely watching him. After hearing the eyewitness testify, the defendant asked a judge for permission to speak. The request was refused. “I got a lot to say,” Fitzsimons told his lawyer, Tariq Harb, after the court adjourned and the guards were handcuffing him for the trip to prison. One of the judges, presiding over the 45-minute hearing, read written testimonies of three foreign security contractors who have left Iraq since the fatal incident. The trial of a security contractor from Manchester charged with killing two of his colleagues in Iraq last year has opened in Baghdad. 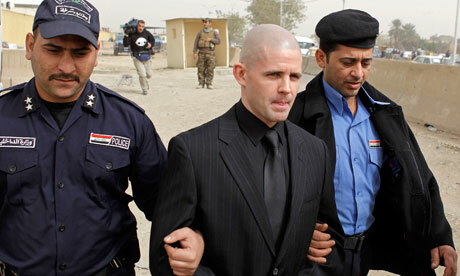 Danny Fitzsimons, from Middleton, Manchester, is the first Westerner to go on trial in an Iraqi court since a 2009 US-Iraqi security agreement lifted immunity for foreign contractors. He was at Wednesday’s hearing which adjourned the trial until January 23. He has been charged with shooting and killing two contractors — a British and an Australian — during an argument inside Baghdad’s fortified Green Zone in June last year and then wounding an Iraqi while fleeing. All three men were working for the British security firm ArmorGroup Iraq.